I've been a runner since I was in 8th grade. I started that summer to try and get in shape for playing soccer. It was awful. Trying improve endurance and increase your lung capacity-it's just not fun. And it's a total mind game. You think, "I am in control of wether I run or not. I could start walking with the next step if I really wanted to." Well my sophomore year of high school I came down with mono right as the tryouts of soccer were starting. It was a blessing in disguise really. I was really bad at soccer anyway. When I had recovered from mono a couple months later, I joined the track team to try and get myself in shape again. I was right back at square one after being sick so long. During practices and meets I began to really like the girls and they convinced me to try cross country. Who knows what possessed me to train that summer with them and join the team that fall, but I never looked back. Once you get past the breathlessness and wobbly legs, you start to feel so empowered. Pushing your body further and further makes you appreciate your body more. Since beginning running I have run thousands of miles and 7 marathons. About 4 years ago I began to have trouble. I had IT band syndrome after my 7th marathon when I ran a half marathon about a month later. I didn't worry too much and just took the winter off. I became pregnant with Claire and was able to run through it, but after she was born the pain was back. I did a cortisone shot, physical therapy, and nothing worked. I finally had surgery to lengthen my IT band in the summer of 2014. I ran a little when time permitted, but nothing much. When I finally was able to run again last summer, the same pain on the inside of my knee came up. I had knee tendon bursitis now. This time physical therapy worked and I have been running twice a week all winter long. It's so exciting to be back running after a long process! 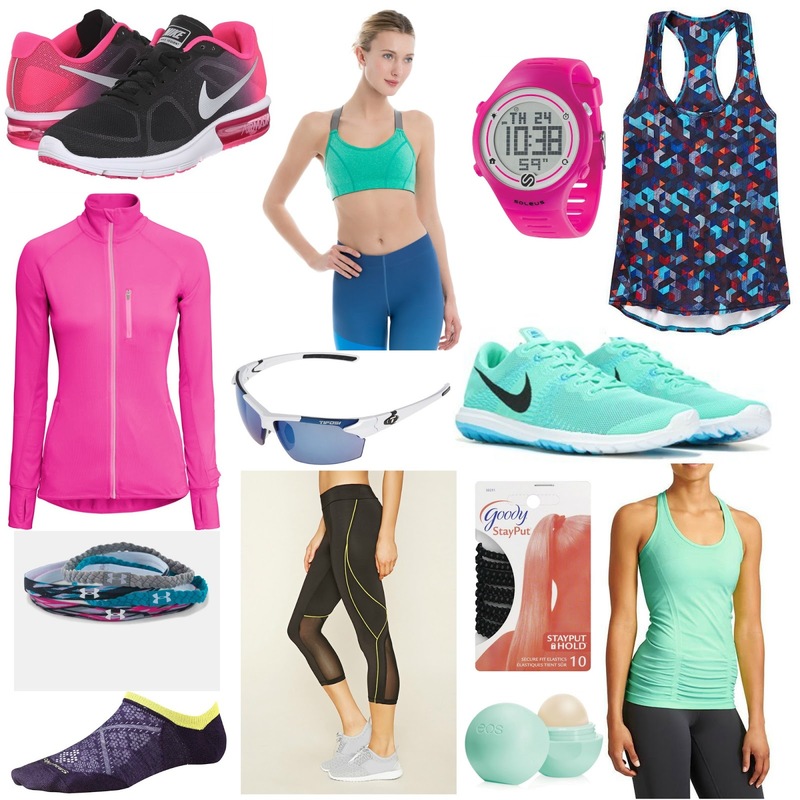 This summer I am planning on running quite a bit and I revamping my running gear in preparation. Oh wow, I'm glad you are able to run again after all these little injuries. I used to run all the time, though I could feel it in my knees and shins, so I've switched to swimming in the summer and a low impact routine in the winter. Though I still could use some of these items. Especially the Nike mint shoes. They are beautiful! You go girl. I have only run a half marathon. I so need to get back in to running. My running days were short lived. I ran a half and then had a few injuries that put a stop to it. I would love to start up again! Love all of your essential picks! I am so excited you can run again! I haven't had any problems with running yet, but I know plenty that have or do... I always worry about that, because it is a strenuous sport! I can't believe you've ran 7 marathons, wow! These are all great picks, I love the tank! Hope you can get back into your routine, I wish I could be a dedicated runner. I get soo bored. I'm more of a sprinter. So glad to hear that you are easing back into running again! I'd LOVE to meet up for a race or run sometime-- a "running bloggers" meetup :-) And I love my smartwool socks. I got a pair from as a raffle prize once and would definitely buy more-- their designs are much cuter now! I hate running, but I admire those that do. I love the workout clothes you picked though and the Nike's are my favorite! I've tried to get into running so many times but just can't get past the first couple of months...even though I know it's all in my head. Good for you for sticking with it even through so many injuries! i had no idea you were a runner--what a cool thing to learn about you!! and witj this cute gear, you can't go wrong!